WHAT TYPES OF SWINGS IS THIS HANGING KIT FOR? 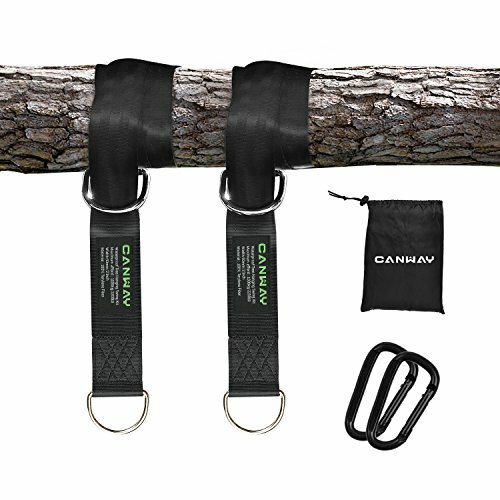 STRONG & SAFE:The swing hanging straps adopt high-density nylon,to withstand harsh winters and brutal summers.The D-rings and carainer hooks are made of premium stainless steel, nearly indestructible.Each strap holds up to 550LB when it's directly used and 1100LB when it's folded. EASY INSTALLATION WITH TREE PROTECTION :Just lay the strap around a horizontal tree branch, and put the smaller D-ring though the bigger one,clip on the carabiner.You can loop it around the tree limb a couple of times, until it's the length you want.No drilling or screwing involved,no harm to the tree or nature. KEEP RELAX AND FUN: Get your family outdoors and enjoy quality time on the backyard swing,to experience a relaxed and memorable day together.It can help strengthen your family ties.It can reduce stress from the hectic everyday life. Kids smile naturally with the swing up and down. FITS ALL SWINGS: Use a single strap for tire swings, disc swings, and web swings. Get two for classic sling seats, toddler swings, and porch swings. Also,our sewing strap is perfect for hammock, rope swing or hanging lounge chair. Our Canway swing can help strengthen your family ties.It can reduce stress from the hectic everyday life.Kids smile naturally along with every swing up and down. BUY WITH 100% Gurantee:We offer 2 years free protection from the date of its original purchase. if there is anything you don't like about your hanging straps, you can return it for a full refund.